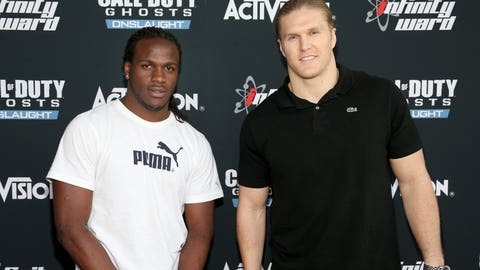 Jamaal Charles and Clay Matthews spend some time playing XBOX. Chiefs running back Jamaal Charles’ first stop home from the 2014 Pro Bowl was in Los Angeles, Calif. to partake in Call of Duty: Ghosts celebrity Grudge Match for the Onslaught DLC. Charles, whose hobbies outside of football include DJing and playing video games, was able to play against Packers linebacker Clay Matthews on Tuesday. Charles got the best of Matthews in their head-to-head match, but that didn’t damper his spirits. Onslaught is the first downloadable map pack for Call of Duty: Ghosts, which debuted on XBOX Live.